At Roof Plus Ltd we realise that although Pitched Roofs are a preferred way to weather-proof a building, that there are instances when only a Flat Roof is practical. 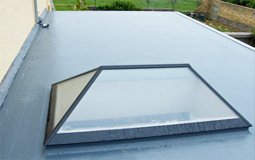 We offer several ways to weather-proof a flat roof including Lead (See Lead-Work page) traditional built-up Flat Roofing, Torch-on Flat Roofing and Single Ply Membranes. 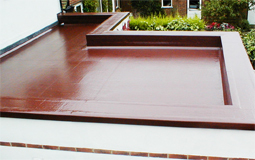 Still one of the most common types of Flat Roofing is built-up Flat Roofing using a Bitumen boiler and HT Felts, flat roofs completed using this method are often hard-wearing and can offer a long-lasting weatherproof solution at a competitive price. Roof Plus Ltd hold all the relevant insurances and have flat roofers with vast experience in this type of roofing, recent projects including a range of amenity restaurants completed nationwide and several commercial contracts. Torch-on Flat Roofing is very similar to the above, but omits the need for a bitumen boiler, and suits a range of applications. The advance in Torch-on Felt has meant that a Torch-On Flat roof completed correctly can last well in excess of 15 years. Roof Plus Ltd will only supply and fix Torch-On Felts by reputable manufacturers including IKO and Icopal, most roofs completed by Roof Plus Ltd will have a minimum of a 10 year manufacturers material guarantee. There are several Single Ply Membranes available, at Roof Plus Ltd we have chosen to recommend the only PVC Single Ply Membrane manufactured in the UK. This is IKO Armourplan manufactured in Chesterfield, a roof completed by Roof Plus in Armourplan will have a minimum of a 15 year insured back guarantee. We can also install several other Single Ply Membranes where necessary including Rhepanol, Rhenofol and Spectraplan. Please see www.singleply.co.uk for full details of every single ply membrane of which Roof Plus Ltd are approved installers.